Christmas Eve is the most festive day of Christmas in Prague and the Czech Republic. People spend the day at home with their family, and in the evening give presents and enjoy a traditional Christmas dinner. Merry Christmas to one and all: Veselé Vánoce! Christmas Eve is the most important day of Christmas for the Czech people, so most locals stay at home. With fewer people around, it is a wonderfully peaceful time to explore Prague, and can be especially charming if the squares are dusted with snow or a heavy frost, giving the city a real 'olden day' charm. There is still sightseeing and entertainment to enjoy, but the operating hours are limited, and only certain restaurants and shops are open. So the day takes a little planning. The Christmas markets are open from 10am to 10pm. Sightseeing and walking tours of Prague operate in the morning and early afternoon only. There are no excursions to places outside Prague. 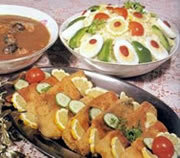 The lunch cruise is the only river cruise running - sightseeing. For entertainment, in the afternoon and early evening there are some wonderful Christmas concerts and ballet performances - classical concerts & ballet. For dining, many restaurants close completely, while those that remain open have limited opening hours. Reservations are advisable therefore for both lunch and dinner (most restaurants are booked out well in advance). You can see what menus are available and make reservations via our Prague Christmas Planner. Some churches hold an afternoon Christmas mass for children, normally at 16:00. Tyn Church at the Old Town Square has a mass at 16:30. Entrance is free, just turn up. Arrive early. 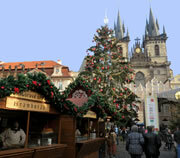 An open-air Christmas Mass is held on the stage at the Old Town Square at 21:00. Entrance is free, just turn up. A Midnight Mass is held at Strahov Monastery and at other churches around Prague. Entrance is free, just turn up. 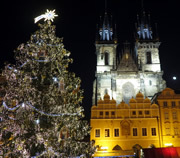 For detailed information on what is open and when on Christmas Eve in Prague, and to book restaurants, sightseeing and entertainment, see the Christmas Planner. 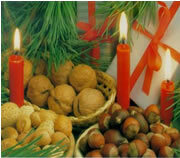 To discover what a traditional Czech Christmas is, one has to naturally look at the family and at food. Czech people generally spend the afternoon of Christmas Eve at home, dressing the Christmas tree and preparing food for the evening celebrations. During the day, Czechs traditionally are not allowed to eat meat. Instead, they eat a dish such as sauerkraut soup. This ensures they will see the golden piglet (bringing them wealth in the year ahead). This lasts until after sunset, when Christmas dinner is served. Carp is the central ingredient of a Czech Christmas dinner. The fish is typically bought live from street sellers in towns and villages in the days running up to Christmas - to see carp on sale in central Prague, go to Republic Square (Namesti republiky). The fish is brought home, often stored in the bath, then prepared, coated in breadcrumbs and fried. It is served with potato salad as the main course. Fish soup forms the starter, with apple strudel or Christmas sweetbread (vánočka) for dessert. 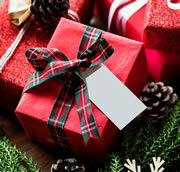 Presents are brought by Jezisek (little Jesus), not by Father Christmas or Santa Claus. No-one knows what Jezisek looks like or how he does it, but after dinner when the family moves from the dining room to the lounge, presents will have magically appeared under the Christmas tree while they were eating, without anyone noticing! Children are amazed at how it happens, but that is the wonder of Christmas. Later on, with the presents open and a nicely dressed Christmas tree in the corner, the evening is spent playing games, watching traditional children's stories on television and chatting. There is always a good supply of home-made pastries and snacks to enjoy throughout the evening. Plus for adults, plenty of Czech beer, wines and local spirits! Later on, families may attend midnight mass at their local church. If you are spending Christmas in Prague and would like to try a traditional Czech Christmas dinner, we list the restaurants that offer it in the Christmas Planner.